Every once in a while. 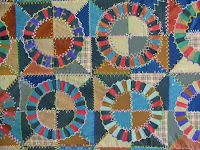 some wonderful strange quilt surfaces on ebay, that online auction site. If I bid on something and miss it, sometimes I'll file the image. 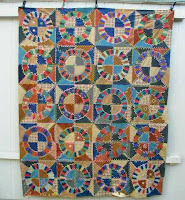 Such is the case with this wonderful early 20th century patchwork masterpiece inspired by crazy quilting. 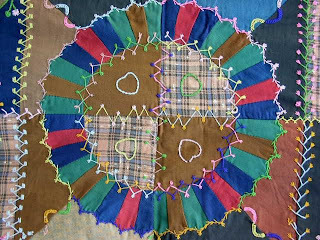 Only a quilt top and made from common wool fabrics, the way too much (and just-enough embroidery) is what makes the piece so endearing. Somewhere, someone was able to buy this old quilt and I hope they're giving it a good home. Enough with the pillows and 'cutter' stuff! If I thought folks were gonna cut these up, I'd be trying to cast some kind of "Do Not Cut" spell. Isn't this sweet?